Hi, my name’s Lucy and just in case you couldn’t tell by looking at my photo, I’m a golden retriever. In fact I’m a pure bred Goldy with, like.... papers as well, which I think makes me pretty wonderful. I live at Misty Valley Country Cottages in Denmark WA with my awesome owners Warren and Leonie. My best friend is another Goldy called Molly who is over ten years old - and between you and I is like,... really slow, and along with all the other animals there are two cats called Chloe and Wilfred. I’m two and a half years old (so pretty grown up) and love entertaining visitors, and chasing the tennis ball when it is thrown for me..... or even better when someone hits it with the tennis racket, that’s REALLY wicked!! Some of the other things I like doing are running after the cows and, like..... scaring them, or collecting sticks and pine cones to bring home for mum and dad (Warren and Leonie). I’m, like... sooooo disadvantaged you know... because I suffer from a condition which means I’m not allowed to have bones because the marrow in the bones is like way too rich for me, and I get really sick if I eat them. So when you come to visit us remember not to give me any bones, as much as I would really love to have one or two. If you want to come and stay with us all sometime and you have a really nice dog as well like me, make sure they come with you too, because I love to have new friends to like play with and show off to!! Better check it out with Mum and Dad first though just so they, like.... know what’s going on, otherwise they could get really mad, (sigh) they can be soooooo old and boring sometimes. Mum and Dad keep on talking about getting me something called pregnant next year and having puppies....AS IF! I don’t know what that’s all about, I asked Molly about it once and she said that she tried it a couple of years ago and nothing happened. Molly said that it was all about having, like... babies apparently - that’s what puppies are. I reckon that would be really bad it if happened to me because I’d, like... miss out on all the attention. Plus if I had to feed and, like.... look after these puppy things it would really stop me from having fun all the time. Anyway we’ll have to see what happens, maybe if your dog comes with you they might be able to, like.... give me some more info. Ok... got to go now... just spotted a couple of cows hanging around the fence, just waiting for me to stir them up! So it appears as though self- admiration and relating one’s life story is the flavour of the month at the moment, and of course wouldn’t you know it, those wretched golden retriever dogs -in particular the younger of the two ( Lucy) - as to be expected has stolen the limelight by getting her story in first. That being the case, it’s up to us cats to say our piece in order to balance the scales of popularity and recognition. 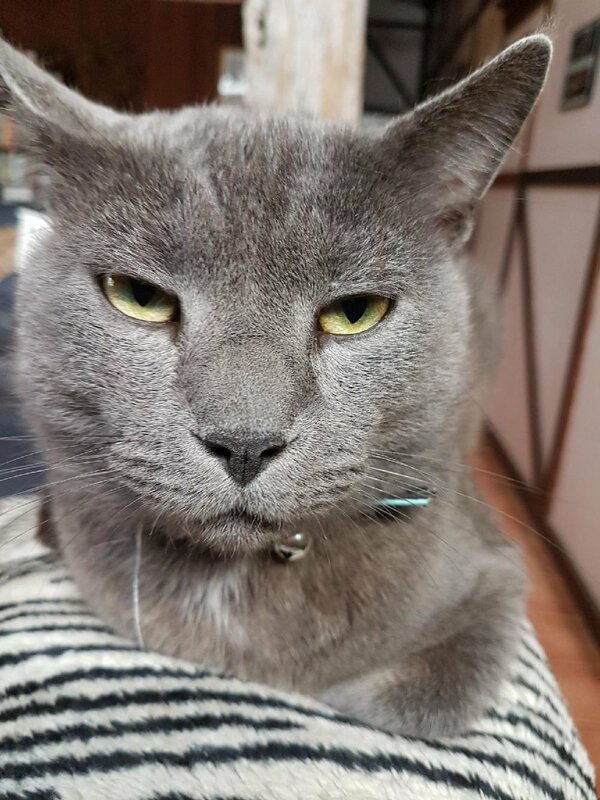 My name is Wilfred and I’m as far as I know about four years old, in fact my official title is Lord Wilfred Montgomery, that’s me in the photo with the beautiful smooth grey fur. I arrived at Misty Valley Country Cottages on September 5th 2016. Up until then my life had been quite miserable due to being abandoned by my previous owners. For some reason, they had to move house and just left me behind to fend for myself. Fortunately a good hearted neighbour heard me calling out and came to my aid. I was taken in by a rescue group in Perth who arranged for me to be fostered out while a place of suitable residence and home was found for me. The couple who fostered me are actually good friends of Warren and Leonie, the owners of Misty Valley Country Cottages. They decided that for me a brand new start with a good life in Denmark would be just what I needed. So here I am and I have to say I am absolutely loving it, and being doted on by Warren and Leonie (as well they should!). As far as the other animals go, I get along with them quite well. That pest of a golden retriever Lucy that I was telling you about, was a bit bit full of herself at first, but I soon put her back in her place. The older of the two retrievers Molly still worries me a little, so I think I need to make a point of asserting myself over her as well. There is another cat living here, her name is Chloe. I think she is part tortoiseshell, although she insists she is absolutely pure bred, although I really do doubt it. She’s very fluffy and likes everyone to think she rules the roost. She likes to have her own way all the time and in actual fact she can be quite aggressive in making sure that others around her, especially myself are aware of her presence. It’s just lucky for her that I have such a good and passive nature and am prepared to put up with her petty behaviour. I’m a lover not a fighter and quite prepared to keep the peace. I must also say that the food here is most excellent and being a foodie myself, I make sure that I make the most of enjoying it, as often as possible. Some of my favourite meals are kangaroo mince and cooked chicken. In fact I would have to say that along with washing as often as possible to maintain my personal hygiene, and of course sleeping, eating would have to be one of my favourite pastimes. I like nothing more than to be on a cold winters day dozing beside the wood fire, waking occasionally to enjoy some tasty morsel from my food bowl. Speaking of which, it must be getting close to my dinner time. I better go and make sure the staff, (Warren and Leonie) are preparing something delicious for me. Perhaps when you come to visit us at Misty Valley I will make myself available and grace you with my presence, hmmmm just purrrrrhaps!